On this Veterans Day of 2018 we honor all those who have served in our Armed Forces. We honor those who served, and are home with us. Thank you. We also honor those no longer with us. Included are those submariners – including Montanans – on eternal patrol, and all those who died while and after defending our nation and our values while serving in any branch of the military. 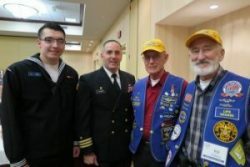 We were especially touched awhile back when Committee members Anna and Ernie Steiner made a donation to our work and asked if it could be listed as being in honor and memory of Anna’s father who served in the Navy. Of course we agreed. The Steiners’ request caused us to want to know more about this veteran and his service to his country. We are thankful for the story we found. It is one undoubtedly similar in many ways to those of millions of other veterans. But it was special in bringing home to us the personal importance of military service in history and today. Lieutenant Commander Philip Beilock was a farm kid who had enlisted in the Navy before he was 18 years old. He earned a commission during the Second World War and had a Navy career of almost 26 years. He went on to other defense-related work after the Navy. He died in 2005. LCDR Beilock’s family tells us that the Navy was a life highlight. He valued his service. He valued his ship and its crew. He valued education and was always grateful that the Navy supported his earning a college degree. Mr. Beilock’s biography may be accessed here. Today we remember that every man and woman veteran has given much. They have also learned and gained lifetime friendships by their time in the military. And they have contributed just like Phil Beilock to their country and to their society after their military service. We also are reminded that our active duty military, including the young sailors of the future USS MONTANA whom we support, will be the veterans of the future. We pray they all come home safely, bringing their skills, their hopes and dreams, and their energy that will continue to benefit us all as we continue to support them. In the future we hope to share other Committee member and supporter stories of other veterans, including those of Montanans who died in the submarine service during past wars. And please remember that we welcome requests that donations be made in honor and/or memory of a veteran. Holland Club hat symbolizing earning submariner dolphins 50 or more years ago. 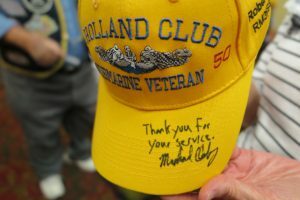 Autographed by the CO of PCU MONTANA CDR Michael Delaney.